If you are looking for a place to vacation, either with your family or a couple of friends, Sea Fans offers a great deal of privacy and is a one-of-a-kind villa. Each bedroom is designed with the privacy of the guests in mind. There is a private entrance, outdoor shower, and air-conditioning in each bedroom. Also with each bed room is an en-suite bathroom. Tennis is available to play close by, and the beach is only about a minute’s walk. The sunset view is ideal for those who enjoy sitting out on the balcony in the evening, and the house has many selections of things to offer guests, including a book and game library, and a good selection of music to play. Sea Fans Villa was designed so that each of the bedrooms is private. Each hexagon-shaped bedroom has its own separate entrance, A/C, bathroom and “outdoor” shower (no one can see in but you can watch the sunset over Drake’s Channel). There are 2 separate beachside bedroom pods and a 2-story, 2-bedroom pod (both bedrooms are accessed from the exterior; exterior staircase to upper bedroom). The second floor bedroom has a kitchenette. Each bedroom has its own large covered terrace with teak furniture. There is a wet bar by the pool, complete with an ice maker and refrigerator. The main house has a high cathedral roof with 4 ceiling fans and indirect lighting. There is a modern, extremely well equipped kitchen with a dishwasher, microwave oven, toaster oven and refrigerator/freezer with water and ice dispensed through the door. The large center island has a beautiful polished granite top with stools beneath it. The flooring in all living areas is Mexican stone tile. Although “earth tones” are prevalent throughout the interior, bright floral patterns brighten up each room. A glass-top, stone-base dining room table seats 6 comfortably. An L-shaped sitting area just off the kitchen is set up for easy conversation or to watch TV. A library of books, videos, games and CDs, DSL line, and Wi-Fi is available for your enjoyment. Washer and dryer can be used at villa. 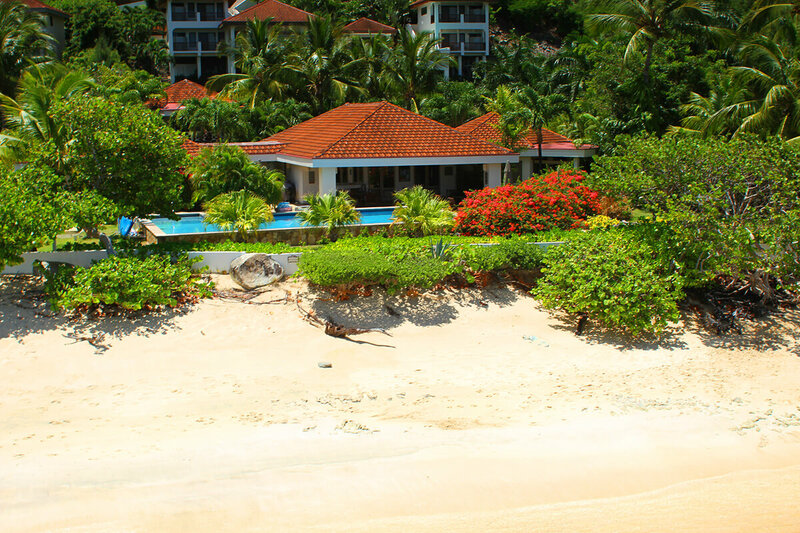 Mahoe Bay Beach is seconds from villa.